I got my first pair of Converse in October. They are grey, which you may have noticed is my favourite colour of all time. P.S. I love grey too. Or is a gray? I never know. They are so classic and comfy, I’ve had a few pair. 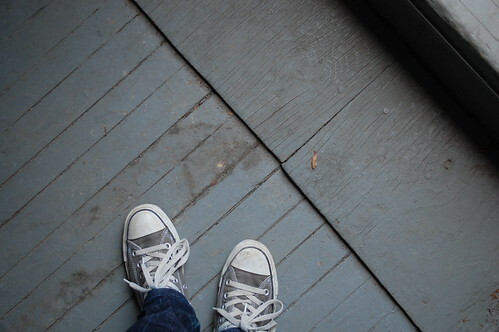 I love my converse, I have always worn black. Now i’m tempted to try grey. Love the photo. I love my 3 pairs of converses! I don’t have grey (just coral low tops, green and black high tops). They hurt my feet for a couple of days when I first got them but then the magic kicks in and i can walk for miles in ’em! Love ’em especially my black ones. Your 365 is shaping up nicely. I LOVE CONVERSE!!! I have been a life long fan (I own about 20 pairs). I actually love them so much that I told my honey that all I want, every year, for my birthday is a new pair of converse. They make me so happy. I wish I could wear them to work. Maybe I should do a series of my sneakers for my 365 project??? Thanks for the idea Karyn! BTW – your sneakers look awesome.